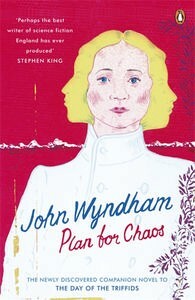 I’ve got a long piece about Penguin’s “new” John Wyndham novel, Plan for Chaos, in this morning’s Weekend Australian. As I say in the review, it’s a pretty dreadful book, but if you’re an admirer of Wyndham (as I am) it’s not entirely without interest, if only for the way it offers a link between his career as a pulp novelist before World War II and the amazing run of novels that begins with The Day of the Triffids and ends with The Midwich Cuckoos. If you’re in the mood for a Wyndhamesque Saturday you might also want to check out my post from a while back about The Day of the Triffids, and why British visions of the end of the world differ so much from American fantasies about the apocalypse. Or you could take a look at David Ketterer’s excellent introduction to the Liverpool University Press edition of Plan for Chaos. And if you’d like to take a look at the rather fab Brian Cronin covers Penguin have commissioned for the reissued set of Wyndhams they’re available on Penguin’s blog, and make an interesting contrast to the covers I remember from the 1980s (Penguin’s UK site also features a rather fun historical index of all Penguin’s SF covers for those who want to take these things to extremes). I first read back Triffids in High School English, enjoying at the time without noticing its datedness at all, an element which now seems inescapably obvious even though the book was still unputdownable. I’ve scribbled a bit about it at http://davidlevell.wordpress.com anyhow.